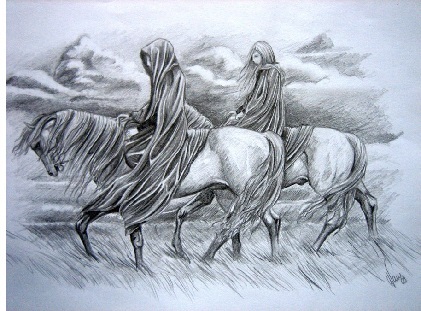 Húrin & Morwen - When Men arrived in Beleriand, they came in three great waves of migration. This established the Three Houses of the Edain (Edain is the Sindarin word for Men, Atani is Quenya). The first was the House of Bëor. They were the first to arrive in Beleriand, but smallest in number. The third was the House of Hador. They were the last to arrive, but largest in number. Morwen came from the House of Bëor and Húrin from the House of Hador. They would marry and become the parents of Túrin & Nienor.